Coach Dave a Hall of Famer! 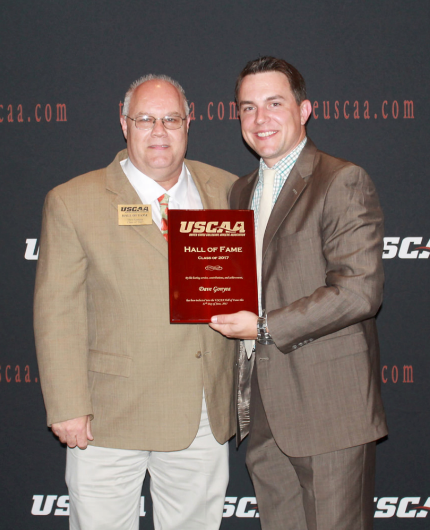 Congratulations to our own Dave Gonyea, inducted recently into the United States Collegiate Athletic Association (USCAA) Inaugural Hall of Fame. Dave has been with CMCC for 24 years and serves as Director of Athletics, Housing and Security. A long-time contributor to the USCAA, Coach Gonyea just finished his 24th season as head coach of the men’s basketball team with an impressive 481-219 record over the last twenty-four seasons. Under his leadership, the men have won nine league championships, three New England championships, and participated in 12 NSCAA/USCAA national championship tournaments. In 2002, the Mustangs won the USCAA national championship. Coach led his team to an undefeated season in 2012 (18-0), a Yankee Conference Championship, and a trip to the USCAA National Tournament held in Uniontown, PA.
Gonyea was named 1996-97 New England Coach of the Year, 1998-99 and 2000-01 NSCAA Athletic Director of the Year, 2002 USCAA Athletic Director of the Year, and 1998-99, 1999-00, 2000-01, 2001-02, & 2002-03 MSCC Coach of the Year, as well as the 2007-08, 2013-14, 2015-16, Yankee Conference Coach of the Year. The iUSCAA Hall of Fame Dinner was held June 11th in Norfolk, Virginia, home of the USCAA National Office where the Hall of Fame will be housed.